Despite uncertainty around the world and toxic divisiveness in their own country, Filipino millennials, or Phillennials, are among the most optimistic globally when it comes to the future. Results from Deloitte’s 2017 millennial survey released by Deloitte Southeast Asia member firm Navarro Amper & Co. (NA&Co.) showed that 89 percent of Phillennials expect the overall economic situation in the country to improve in the next 12 months, significantly higher than the global average of 45 percent and the Southeast Asia average of 53 percent. An overwhelming proportion of Phillennials – 84 percent – also have a rosy outlook for the country’s social and political situation, while only 36 percent of their peers globally share that sentiment about the general sociopolitical situation. The 2017 Deloitte Millennial Survey is based on the views of almost 8,000 millennials from 30 countries. Participants were born after 1982, have a college or university degree, are employed full-time, and work at predominantly large, private-sector organisations. In the Philippines, 300 millennials – equally split based on gender – were interviewed. Legwork for the survey was done in the last quarter of 2016. In a reverse from last year’s survey results, economic optimism among millennials in emerging markets is on the upswing and is, in fact, at the highest level recorded in the study. Meanwhile, confidence among their peers in developed markets has slumped. Notably, lack of optimism regarding “social progress” is most evident in Belgium, France, Germany, and the UK – nations that are now dealing with the reality of Brexit and the rise of far-right populism. Meanwhile, greater optimism is seen in the Philippines, Brazil, India, Indonesia, and Turkey. On a more personal level, most Phillennials also expect to be financially better off (84 percent) and happier (76 percent) than their parents. Globally, those figures stand at just 26 percent and 23 percent, respectively. To better understand the millennial outlook, Deloitte asked respondents about issues that are of greatest concern to them. 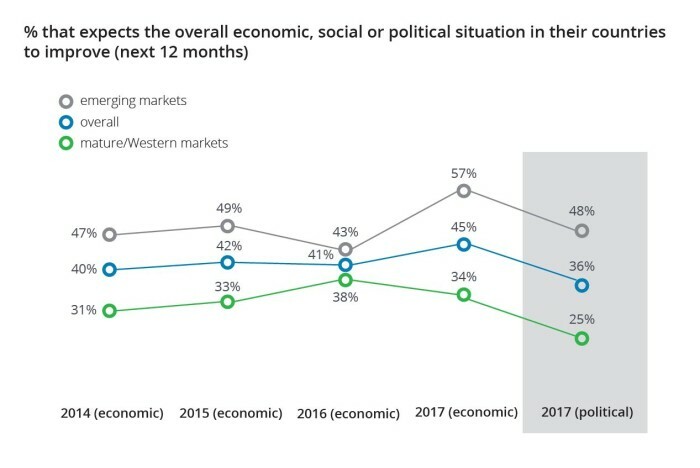 A broad spectrum of issues surrounding conflict – such as terrorism, political instability/tension, and wars/conflicts between countries – emerged as issues that span the market maturity divide, with almost 6 in 10 (56 percent) respondents in mature markets and 4 in 10 (42 percent) in emerging markets citing these as a concern. For Phillennials, terrorism emerged as the topmost concern: 40 percent of them admitting it worries them, while 35 percent cite crime/personal safety as a great concern. Perhaps one factor fueling Phillennials’ confidence is their belief in the ability of key institutions to address their worries: More than 9 out of 10 Phillennials feel that not only does the government have the ability to solve the issues that worry them, it has already made a positive impact in addressing these problems. They are only slightly less confident in the ability of corporations – multinationals and local companies – to do the same. Indeed, Phillennials’ belief in the inherent good of businesses continues unabated, with 94 percent of them saying businesses have a positive impact on the wider society, up from 93 percent in 2016 and well above this year’s global average of 76 percent. 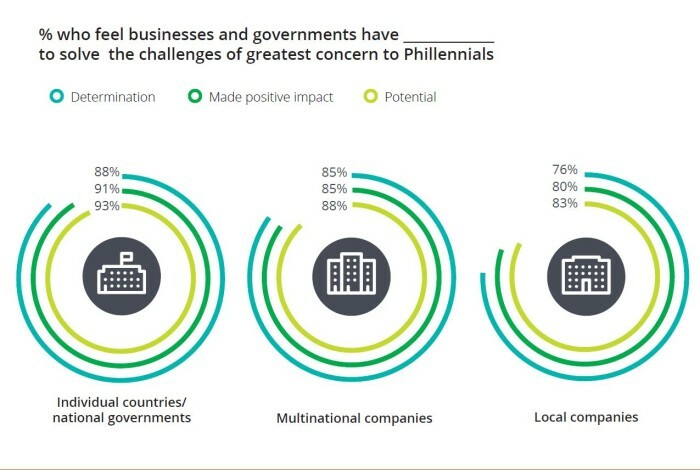 With the recent rise of unconventional leaders such as Presidents Rodrigo Duterte and Donald Trump, Deloitte also asked millennials where they stand with regard to the way politicians and business leaders behave. For Phillennials, there seems to be a slight difference in expectations: While nearly 8 out of 10 (78 percent) Phillennials approve of political and business leaders providing opinions with passion, only 66 percent agree that business leaders should use plain, straight-talking language to express those opinions. A bigger proportion – 69 percent – believe it is acceptable for politicians to speak that way. 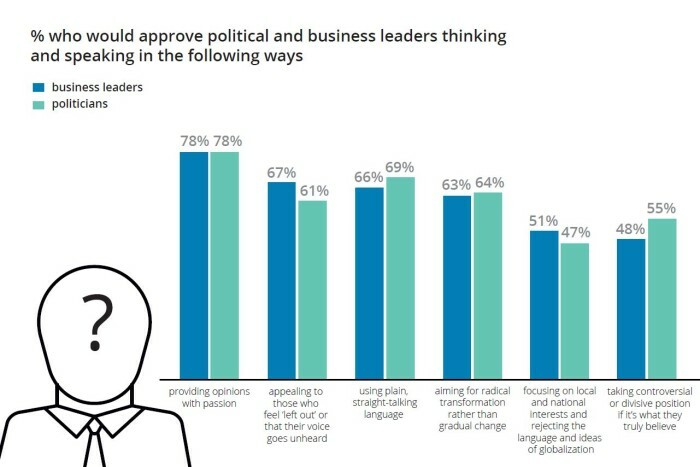 A similar disconnect can be seen in Phillennials’ attitude towards leaders who take controversial or divisive positions: Only 48 percent think it’s acceptable for business leaders to do so, but when it comes to politicians, they are more lenient – 55 percent approve of such behavior among their political leaders. Phillennials seem to approve equally of business leaders and politicians who aim for radical – as opposed to gradual – change. Another issue Deloitte has been tracking in its survey is millennials’ sense of empowerment and accountability within the context of their workplace. Trend data shows that businesses that make CSR a cornerstone of their mission and which involve millennials in such initiatives boost this generational cohort’s sense of empowerment and, as a result, increase their levels of loyalty. This is good news for local businesses as 72 percent of Phillennials said they feel enabled to contribute to charities/good causes at work, compared to just 54 percent of millennials globally. More Phillennials also expressed a desire to stay longer in their current employment: Last year, only 10 percent of Phillennials said they plan to stay for more than five years in their current job; that figure has risen to 34 percent this year. And despite the growing popularity of freelance work, or the ‘gig economy,’ only 36 percent of Phillennials expressed a preference for this type of work. The rest would rather be employed full-time or on a permanent basis. One way employers can gauge their millennial employees’ engagement is to look at the aspects of their work that they feel they are most accountable for, and then determine if these millennials believe they have enough influence over these matters. In the case of Phillennials, there are definite gaps between what they are responsible for and what they can actually affect. Ninety percent of Phillennials believe they are accountable for client/customer satisfaction but only 77 percent feel they can influence results in this area. 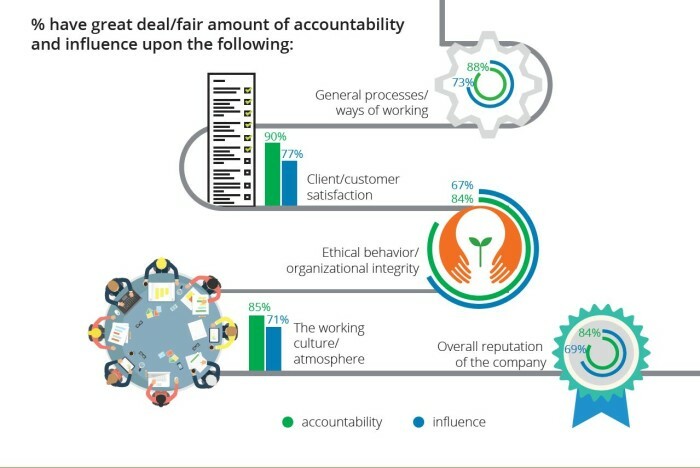 The biggest gap was seen in organisational integrity: 84 percent of Phillennials said they are accountable for ethical behavior at work, but only 67 percent of them feel they have any influence in that area. The 2017 Deloitte Millennial Survey is based on the views of almost 8,000 millennials from 30 countries. Participants were born after 1982, have a college or university degree, are employed full-time, and work at predominantly large, private-sector organizations. In the Philippines, 300 millennials – equally split based on gender – were interviewed. Legwork for the survey was done in the last quarter of 2016.